^^Her favorite nightgown to run around the house in. I had a similar one I was little so when I saw it I had to get it for her!! Happy Friday, everyone!! A few months ago I did a post about the tools I use to get my signature curls (you can see that here). It has been one of my most popular posts so I thought I would do an updated one since I get so many questions on the daily about my hair! #1: Do you have extensions? No I don’t, this is all my natural hair but I’ve been growing it out for years! I wore clip in extensions while I was waiting for my hair to grow out though. If you’re looking for a good extension, my friend Amber’s line is amazing! #2: What hair tools do you use? About 6 months ago I was introduced to T3 after hearing amazing things from girlfriends and other bloggers! I was first drawn to it because their products are white and rose gold and super cute, which is unique for hair tools! 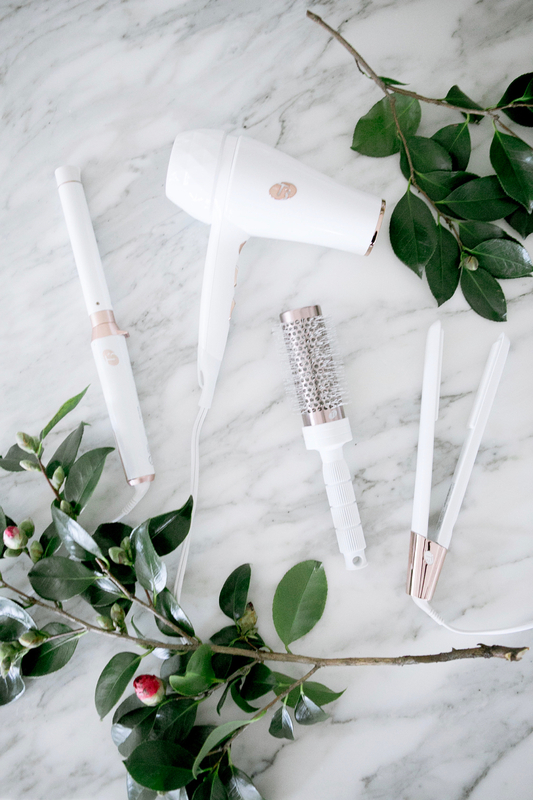 I started by first using their Whirl Trio curling iron and after using it I threw away all my old curling irons. And since I’ve started using their blowdryer and straightener! #3: What Shampoo and Conditioner do you use? I switch off. I use Pureology Nano Works and also the purple Pureology (the one that tingles your scalp, it’s amazing). My hair girl tells me switch up my shampoo and not use the same thing on it every wash.
#4: What are your go-to hair products? I use the wet-brush to brush my hair out (it’s a must if you have long hair). After I get out of the shower before I blow dry my hair I use Pureology root-lift, It’s a 10 with Keratin (the orange lid), and Kerastase shine serum (I also use the serum on my ends before I straighten it). I also use the Nexxum rose gold hairspray (I just get it at the grocery store). #5: What’s the secret to getting long, healthy hair? High-quality heating tools and using products with keratin!!!!! It is seriosuly worth every penny to invest high-quality heating tools that are designed to protect your hair, not damage it. Damaged hair doesn’t grow, it breaks off. Using heat on your hair is what damages it the most. 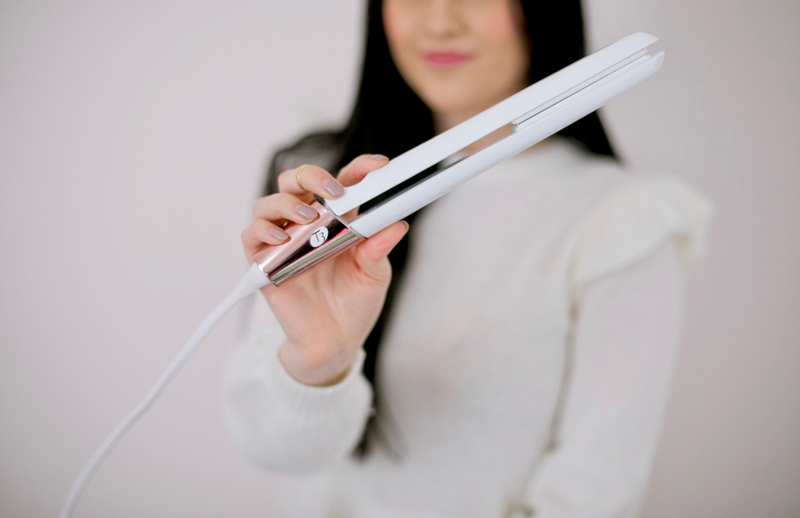 We all have to style our hair with heat whether that’s a blowdryer, straightener or curling iron. 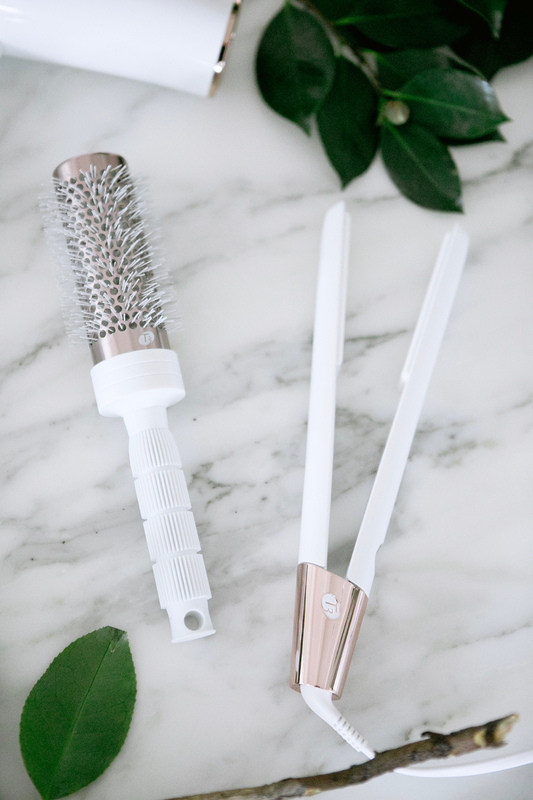 It’s so important to find and use tools that have the technology that will most protect your hair while using heat. I’m sure you have all noticed I’ve been wearing my hair sleek and straight WAY more often than I use to. I LOVE my T3 straightener! 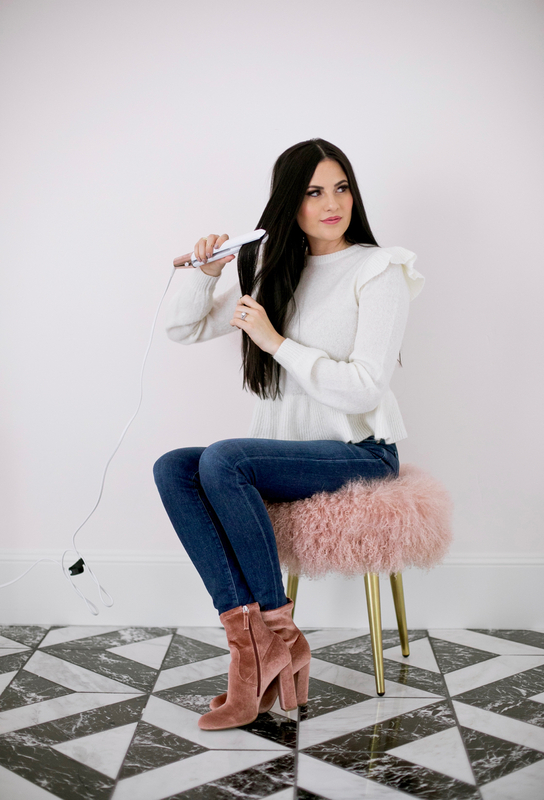 It’s called the SinglePass LUXE and it evenly distributes heat with their signature SinglePass technology so I don’t have to damage my hair by re-straightening the same piece of hair over and over again (the thought makes me want to cringe). It’s also great for creating loose waves too! Ok now for the fun part… Use code PPSPLUXE when you purchase the SinglePass LUXE to get a free SinglePass Compact and be sure to enter their sweepstakes here for a chance to win the SinglePass LUXE! Good luck!!! Brought to you by T3. I’ve seen the Dyson one! It looks crazy! You like it though? And yes, I love Pureology; lifetime user over here! Your hair is gorgeous! Thanks a lot for the tips, I’m definitely gonna be following some. Thank you! Yay! I’m glad you found some new tips! Thanks for sharing this! I heard so many great things about T3! Yes! You need to try! Hope little curls won’t want to straighten her hair anytime soon! My nephew had tiny little curls like that when he was young and my dad loved his hair so much he was so sad when he cut off his curls! I guess finding useful, reliable inifomatron on the internet isn’t hopeless after all. 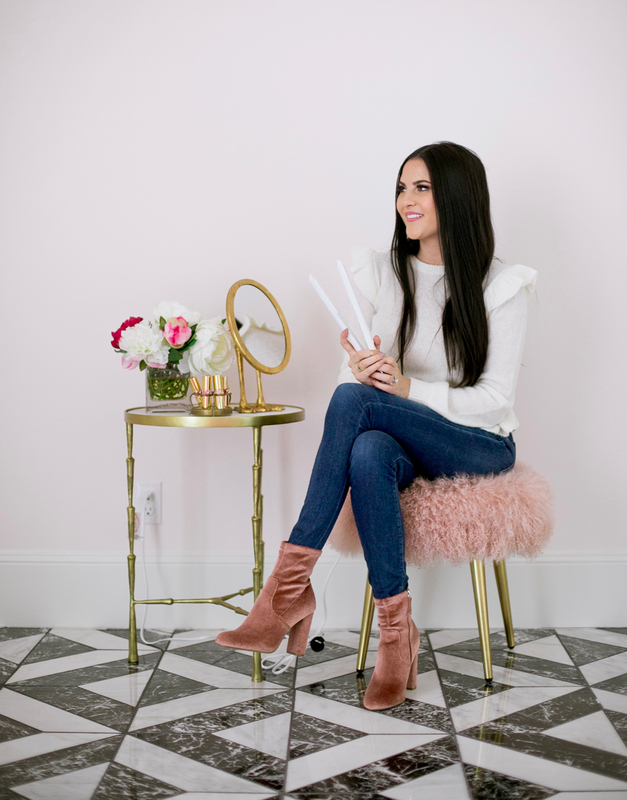 I have the T3 travel blow dryer and love it! Great products! I’ve been seeing T3 products all over lately and I’m becoming more interested in trying out their styling tools. They sound like they’re great quality and I love the design, too. I also want to try out some the hair products you’ve mentioned as well. Thanks for sharing, you have such beautiful shiny hair! I hope you have a great weekend ahead! Definitely!! Give them a shot!! I also know that Nordstrom carries some T3 products, so if you aren’t 100% satisfied, you can return them!! Thanks! I had a nightgown JUST like Isla’s too, when I was little!! Where did you find it?? My mother-in-law makes them and her mom made them before her, so they are the exact same ones from all those years ago! So exciting! Her company is called Little Lady Lingerie. Here is a link to her etsy page. The most I go is about every other day. I really think having the right products is the biggest factor with healthy hair, but everyone has different hair, so I would ask you hair stylist what she would recommend too! Your daughters night gown is to cute. Where is it from? My little girl would love that, its so sweet. Thank you for your hair tips. The T3 Curling wand is my next hair investment! Your hair is always so beautiful, love it! That straightener seriously works miracles!! I love your top and I have heard such great things about T3 products! Just try a few at a time, but I promise you will love them! Your hair is seriously so gorgeous! I wish mine was as thick as yours! Thank you!! You could always do extensions that are the same length as your natural hair just to add some volume! is your hair natural straight and have you ever gotten your hair with the keratin treatment at a salon? It’s naturally pretty straight! Yes, I loved it! You are just flawless! I love that sweater paired with those boots!! Where can I find those boots? I love them! They are linked! By Steve Madden! Loved this post! I didn’t know it was good to switch up shampoos! My hair seems to not grow past my shoulders so I’m going to use some of these tips to help get longer, healthier hair! I didn’t know either until my girl told me and I’m so glad she did! I really feel like it helps! I’m loving your new sleek and straight hair style Rachel!!!! And your boots are beautiful! And Isla… Oh my God, I love when she appears on the photos!!! Thank you!! Sometimes she moves to quick, but I love when she stays still long enough to snap a picture! Your hair is so long and gorgeous! Is black your natural color or do you dye it? I’m curious too what your natural color is? The Pureology Nano is for colored hair so I’m guessing you might use color! I’ve been thinking of going dark! My natural color is pretty close to what it is now, but I do color it to keep it shiny and looking even! 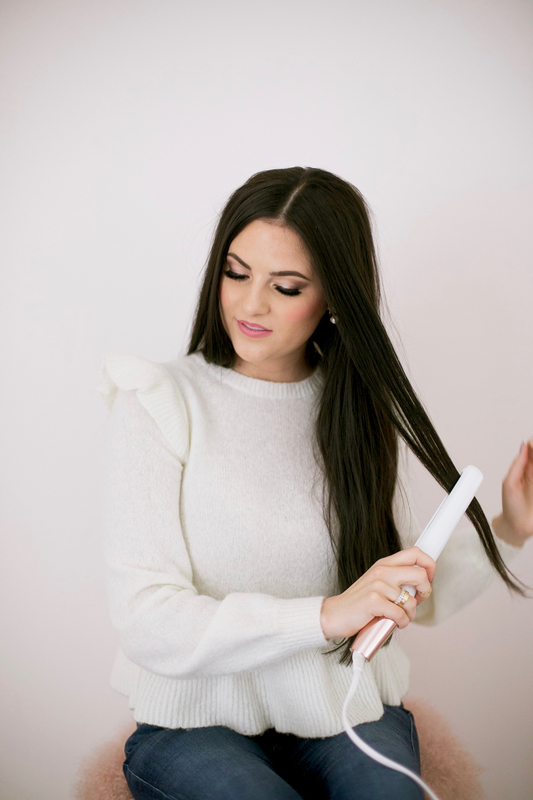 I loved reading this post, your hair is always so gorgeous and silky! I have to try this T3! I have heard so many good things about it! Thanks for the advice! I love learning about new beauty products! Haeujlllah! I needed this-you’re my savior. Where is isla’s cute nightgown from? It’s precious! I love your hair and those boots! Would you mind sharing where you purchase your Pureology and It’s a 10 products?I’ve been trying to grow my hair and am excited to try these but I’m scared of getting knock-off products or ones that have been altered. Thanks! You can find them at Ulta, Amazon, you could even ask your hair stylist to grab you some when they go to the beauty supply. Awesome Tips! I’m surely telling my girlfriend about them! Purchased the T3 curling wand a few months ago and absolutely love it! 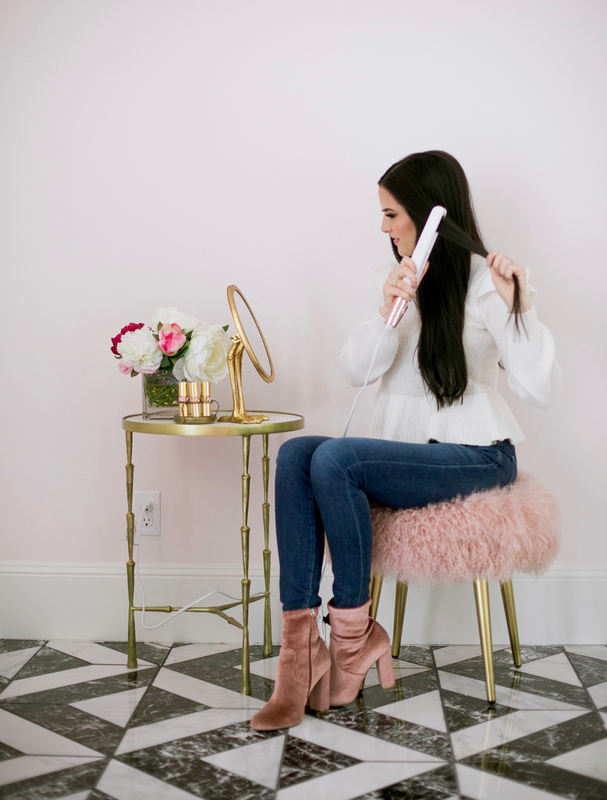 This is the only curling wand that has ever curled my hair and kept the curl lasting almost all day … as opposed to just a few minutes! Can you link where the table and stool are from, I absolutely love them! Great tips! And love your hair. Follow your tips to improve my dry hair. i love that pink stool!! where can i find it?